co-taught by Kenneth Kortemeier and Drew Langsner. This is a late, late newsletter as nothing was put together during the summer. We have a sort-of good excuse. We were fully engaged with a test run for Country Workshops Going Forward with Kenneth & Angela Kortemeier at the helm. We needed time to see how this might work. Also, tutorials were fully enrolled (no need for publicity) and the story about CW Store inventory hadn't changed since our January-March newsletter. Kenneth was here for most of the summer. Angela and young Conrad arrived and departed at different times to maintain something of their on-going interests and obligations. The summer tutorials were co-taught by Kenneth and myself. I usually took the lead so that Kenneth could observe how I've done these classes. (Since 1978.) Kenneth was our summer intern in 1996 and since then he's often been teaching, mostly at The Carpenter's Boatshop on the Maine coast. With tutorials limited to 4 students classes went easily and both of us enjoyed the experience of teaching together. 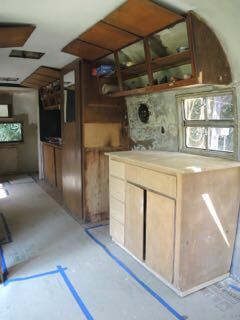 The 1958 Avion aluminum trailer (above) and renovations (below). In between classes we discussed how the Kortemeiers might move here. Housing for them was a question and one idea was to buy a travel trailer that could be used at at the beginning of the transistion, while other things were being set up and a new residence could be built. 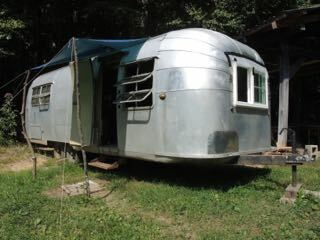 Ken quickly found a 1958 Avion aluminum trailer. This project has turned out to be very time consuming. But also interesting for woodworkers to tackle. (Lots of rivets and flimsy aluminum walls.) It's coming along slowly, but with good results. Of course there was also our regular summer activities which include maintaining the property along with building/grounds maintenance and packing tool orders. Plus sailing for me, kayaking for Louise, and all sorts of activities for the Kortemeiers. By the end of summer we had a Going Forward meeting after lunch one day. What's next? Surprises. During the preceding weeks Louise and I had decided that it was time for us to simplify our lives. And that the way to do this would be to look towards a retirement. We also realized that sharing the workshop and our family kitchen was an ideal that we probably wouldn't be happy with in reality. Kenneth & Angela were relieved to learn this as they had been thinking that Louise and I were about to present a more detailed proposal for Going Forward. In fact, the Kortemeiers had gradually concluded that they really don't want to leave Maine, where they have their home in the coastal forest, a long time community of friends, a good school for Conrad. Most important, Kenneth wants to start his own school which would have similarities to what we've done but also be a Kortemeier creation. So here's the latest ... Country Workshops will be offering tutorials again for summer 2017. 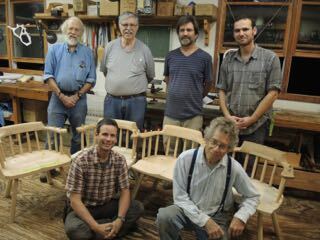 Most likely just two sessions: Carving Bowls and Spoons, and Ladderback Chairmaking. I will be the instructor. Class size is still very limited. The schedule will be announced in our next newsletter, and on the web site when dates are determined. These tutorials will fill quickly. If you're interested you can contact us and get your name on a preference registration list. Meanwhile, the Kortemeiers are busy planning for their school in Maine. We will provide further information and web-links in this newsletter and on the CW website. When Country Workshops started offering classes in 1978 we were often asked about our interest in carving bowls and spoons, and especially about our Swedish inspiration. What is this all about, anyway? Most people thought of wooden spoons as flat things for stirring dough, and wooden bowls came from factories where they were made on copy lathes. Both of these kitchen standards are still excellent utensils, but they're not all that inspiring to create with hand tools. 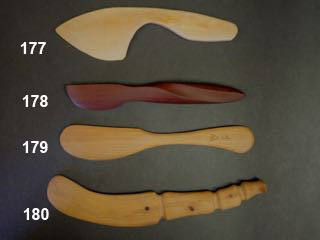 Our first classes in 1978 – Carving Swedish Woodenware – were taught by Wille Sundqvist. Although the the original workshop building was an about to collapse tobacco barn, we had one of the world's best hand tool woodworking teachers here. And we made a concerted effort to have high quality tools available from the start. Getting excellent materials was no problem since we're located in the heart of the eastern hardwood forests. We organized our first international crafts tour in 1991 – to Sweden and Norway. The tour was put together by Jögge Sundqvist, Wille's son. On the route from Stockholm to Oslo Jögge suggested that we visit a new toolmaking business run by Hans and Carina Karlsson. The Karlssons were great hosts. Carina prepared a traditional Swedish workers lunch for us travelers, and then Hans took us to the workshop where he did an impressive demo of how he forges his wonderful hollowing adzes. The tools seemed expensive, but I bought a selection of gouges and an axe head. Back home I got busy using them. I was very impressed, and so was everyone else who had a chance to see and try them. So the CW Store got started. We gradually selected a line of Karlsson gouges and the adzes. (At the time Hans didn't have any axes in regular production.) CW was already selling a few froes – my refinement of the traditional design, fabricated in Greeneville, Tenn and then handled in our workshop. During another tour a few years later Jögge took us to the workshop of Svante and Elsa Djarv. Needless to say, the Svante tools were added to our store selection. Although Svante makes many items, we have focused on a selection of his wonderful knives and axes. web was part of this. But also, in the previous decade or so a small group of woodworkers had decided to take this interest seriously. It was just much more interesting, rewarding and fun than making nice projects with machines. Anyone reading this knows the current situation. The availability of high quality hand tools is far smaller than the current demand. The Karlssons and Djarvs did not set out to have factories; they also wanted to be real craftsmen, making tools, not running a big place with never ending payments on digital machinery. Of course, other suppliers are now appearing. Time and use in our workshops will tell us if these alternatives will integrate into a long-term development of small toolmaking shops who can support the needs of us spoon and bowl carvers. Elsa Djarv tells me that CW's current order should be shipped to us in late October or early November. The Djarvs usually do very well with keeping to their production schedule. About two-thirds of this order has been pre-sold. As of September 30 all of the Svante tools that we've ordered will be available. Keep in mind that our expected inventory level will be going down as we wait for our shipment from Sweden. We don't currently know when our big order with H. Karlsson will be shipped. Some of the most popular items are now sold out for 2016. 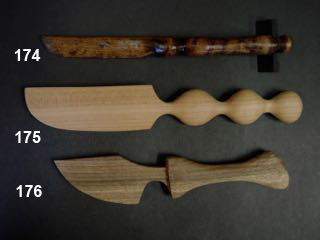 These are: H-112 bent gouge, all of the dog-leg gouges, the H-133 double hoop bent gouge, the H-171 drawknife, and the standard 2-1/4 inch adzes. We will announce the situation for these tools next year once we have a good idea of delivery dates. We still have expect to have inventory for the Karlsson H-166 sloyd axes. Most of the other gouges, inshaves, hook and straight knives, and other specialty tools are not sold out. You can order by phone, e-mail, or postal mail. Phone calls Monday - Saturday; 9 - 6 eastern time. We accept Visa/MasterCard and personal checks. Riving into thirds isn't difficult once your mind accepts the concept. Technical Example. When splitting or riving wood for chair parts, tool handles and basketry we almost always follow the number one rule. 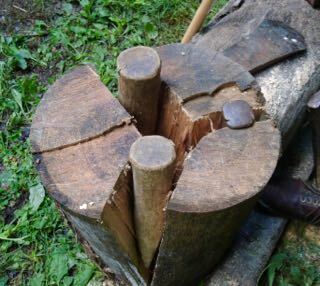 Place your splitting tool (wedge, froe or axe) in the center of mass so that there's approximately equal force (stiffness) on each wide of the developing split. When you're off placement the smaller segment almost always runs out. It gets smaller and smaller as the split progresses. It's often the case that a bolt about to be rived is a dimension where 3 parts would make the best use of the material. With equal splits there is a large amount of waste material. And the piece isn't large enough for 4 splits. In some cases we might go over to the band saw to make the 3 pieces. Other times this isn't possible, or not wanted. During our last Japan tour (2010) we visited an outdoors museum in the mountain town of Takayama. There we were treated to a demonstration of traditional Japanese shingle making. The old shingle maker would rive 3 shingles from a bolt that would have wasted too much material making just 2 shingles. He would start with his froe placed one-third of the way across the engrain of the bolt. Immediately after the first club strike he removed the froe and then placed it in the center of the larger two-thirds segment. Then after a start the froe was removed again and worked in the original split. This back-and-forth was continued until 3 shingles emerged. In our chairmaking tutorials we're now often doing the same thing. The technique is especially useful when riving the large rear posts for ladderbacks. We use 2 wedges, or even 2 froes. This is a simple idea that works really well. 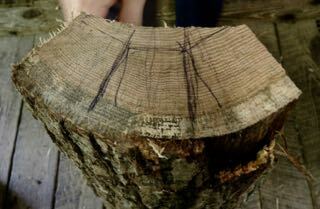 In another example, we sometimes have a chairmaking oak log that has a 3 part split that occured during felling. (Looks like a Mercedes symbol.) These are hard to bust because the splitting wedges can't pass through the center pith during the start of splitting. But now we know what to do. In one end start with 3 wedges in all 3 existing splits. 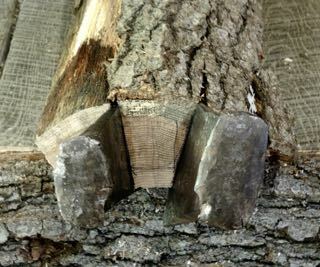 Then you can begin to put other wedges along the bark sides as all 3 splits continue to open up. 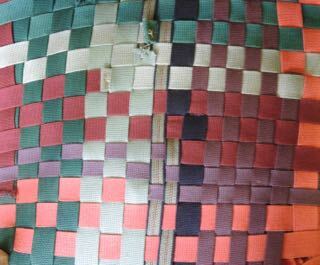 Dan Asher's herringbone weave (above) and checker pattern (below). The Shaker tape that we use comes in a role size where there is often 3-5 feet of tape left over. We've been storing these scraps for years, mostly with the idea that someone may run short, or need to do a repair. 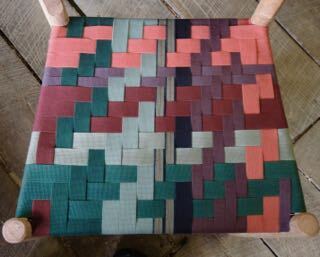 But I've also had the idea that the box of scraps could be used to make a woven patchwork seat. I promoted the idea without success until last year when Nate Chambers and Andy McFate gave this a try. We discovered that the upper level chair rungs can be considered as a framework for a blank canvas. There's countless possibilities. Dan Asher (this year's intern) decided to try two approaches. On the upper surface Dan used a herringbone weave. On the lower surface the checker pattern. He also combined the two different available widths – 1-inch and 5/8-inch. Keep in mind that the checker sample is the lower surface, so it's also where the splices were made. Dan sewed the splices together. You can cheat with a stapler. Butter knives, which are also called spreaders, are utensils that contribute a hand-made accent to any table setting. Making a spreader isn't difficult, but designing one that functions well and has a personal, artistic signature is a challenge. 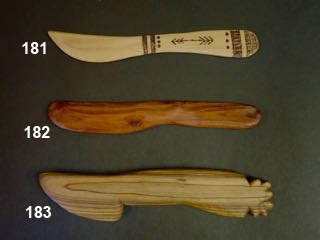 Butter knives can be an excellent personal gift, or a comfortably priced, hand-carved item to sell. 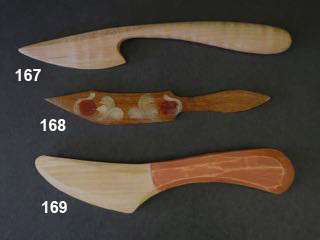 We invite wood carvers to contribute their version of a butter knife to our design/study collection. There is no budget for this project, and it's not a contest. We encourage you to develop a personal design, which should be useful and practical. 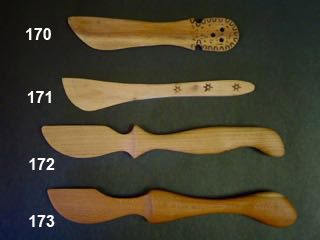 Newly acquired butter knives are featured in this newsletter, and there is a complete web-site archive at Country Workshops' Spreader World Gallery. This includes "as seen from above photos" that are not in the newsletter. Of course the collection is available for viewing and handling when you are at CW. Since our last newsletter the collection has received 17 contributions. Country Workshops distributes our e-Newsletters on an occasioinal basis. If you would like to subscribe, or to refer a friend, click here, type ‘"newsletter" in the subject field. To receive our printed catalog, type “catalog” in the subject field. Be sure to include your full name and postal address in the message section. To see our archive of past newsletters, click here.